More often than not, well-being of your family comes to your mind than your own health. You leave no stone unturned to keep your family safe and sound. However, eventualities like illness that you cannot control are always on the cards. The best you can do is to stay financially protected during such hard times by securing a health insurance plan for your family. The beauty of a family mediclaim policy is it covers both your family and you without any particular limit for individual member of your family. Why family health insurance plans score better than individual plans? A family floater policy gives you relief from the annoying task of maintaining and keeping track of several insurance policies . You don't have to pay for premiums for individual health covers of all members of your family. All members of your family have equal share of the entire sum insured amount in a policy year. Which Family Mediclaim Policy would you choose? There is no dearth of quality family mediclaim policy in India. With the increasing awareness of the consumers the demand for such health cover is on the rise and a plethora of health insurance providers have come up with family health insurance policies to tap into the growing needs. To trace the best plan out of them you need to assess available policies in terms of many parameters. Coverage on offer is one of the most crucial parameters as most plans cover only individual, spouse and children; but few plans extend the coverage to dependent parents, parents-in-law and siblings as well. Seemingly, all family health policies look the same but they differ on the basis of eligibility, benefits and limitations. You need to ensure that your chosen family medical insurance plan will fit your budget and serve all your purposes in near and distant future. India's health insurance gamut is presently brimming with a myriad of family mediclaim policies. 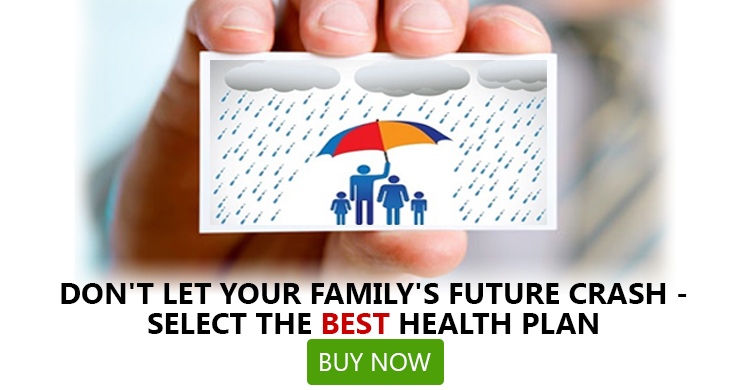 After considering various parameters, we have come up with the list of best 5 health insurance plans for your family. Critical Advantage Rider is available for Sum Insured of Rs 10 Lakh and above. Entry age for adults is 18 years onwards, 91 days to 21 years for children. 20% co-pay is applicable for policyholders seeking treatment in zone 1 hospitals, however, policyholders can avail 10% discount by going for this option. Coverage available for HIV + persons whose CD 4 count is not less than 350 at entry point. Coverage for health check-up Min. Rs. 5000 and Max. Rs.12,000. Air Ambulance cover available from Sum Insured Rs. 7.5 Lakh. 10% co-payment is applicable for for each and every claim made by policyholders over 60 years at entry level and renewals thereafter. Before purchasing a family health insurance plan, you should not only keep abreast of the benefits and features but you should also be aware of the limitations of each of these plans. Family health plans are ideal to cover the expenses of treating diseases but these plans are not effective for people with critical illness that make them unable to earn for a longer period of time. Family health plans unlike critical illness covers don't provide lump sum amount in the event of permanent or temporary disability of policyholders. This is why you should have a clear idea about the coverage and exclusions of the family health policy. To find a family mediclaim policy that comes with adequate sum insured amount, wide coverage, lenient eligibility and least number of exclusions you have to compare various plans. At GIBL, you can compare, select and buy your favorite family medical insurance plan. Avail your policy today and make your family members realize one more time that you care.